From Japan – Fish Eagles. 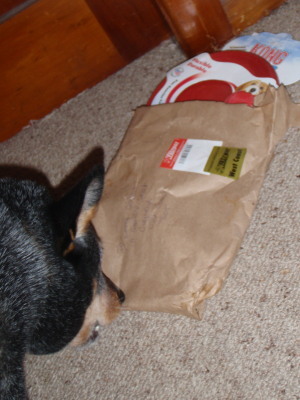 This card is from lovepostcards. 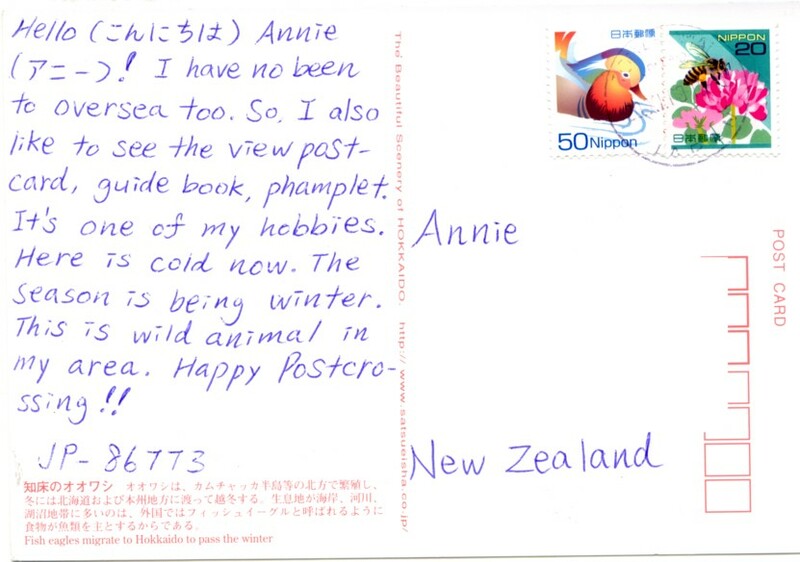 I enjoyed finding out about the ‘fish eagle’ and I also really like the cute stamps on this card. Its territory ranges from northeast Russia to Japan and North Korea. It breeds in Russia and spends up to six months of winter on Hokkaido, which is the northern-most large island of Japan. These birds are very rare and feature in Japan’s Red Data Book There are only about 5000 of them in the world. Like many raptors they have been affected by lead poisoning due to eating the remains of animals that have been shot with lead pellets. 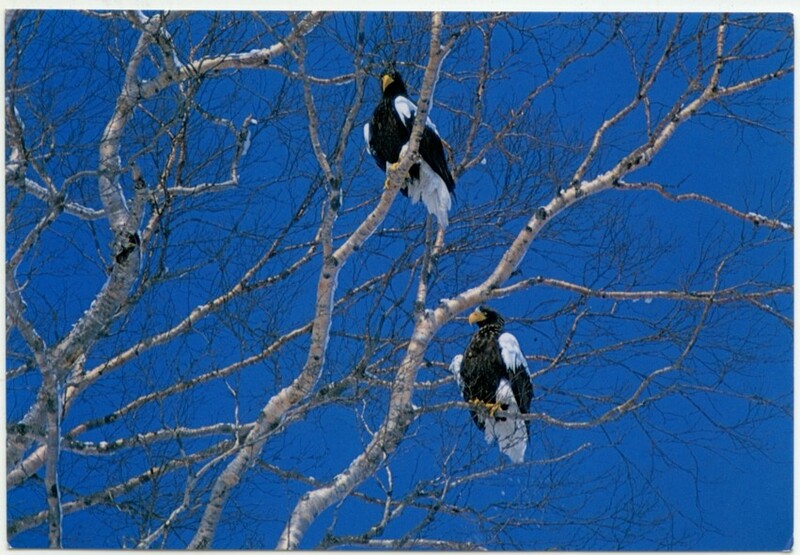 A further possible risk for the Stellar’s Sea-eagle is, strangely enough, wind power!!! Hokkaido is the least developed of Japan’s main islands, but is getting into wind-power in a big way. It is not completely understood how wind turbines affect migratory birds (there have been some investigations in Europe), but as well as the obvious physical risk of flying in to one, there is thought to be disturbances caused by the changed air flow and low-frequency sound produced around wind turbines. So what a quandary. In earnest attempts to develop environmentally friendly power sources, nations may be endangering some bird species. 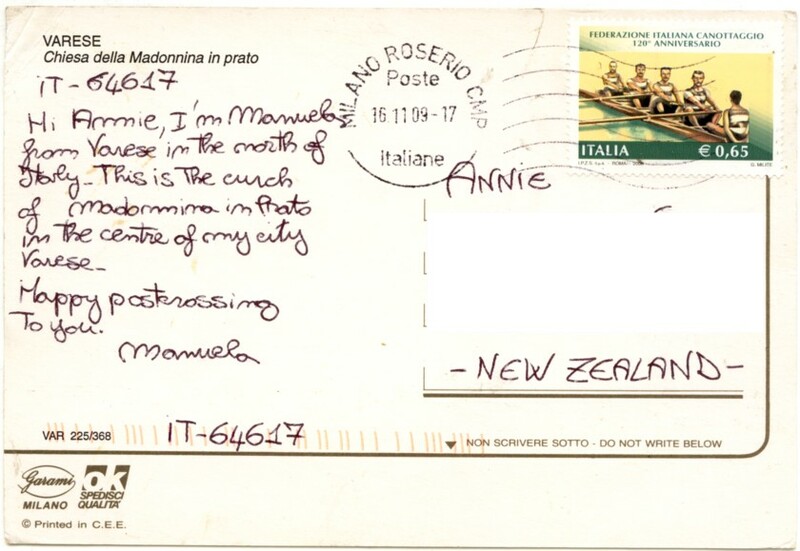 This postcard is from Manuela who lives in Italy. The city features is Varese, which is in the province on Lombardy, in the north of Italy. Varese is 55 km from Milan, but Malpensa International Airport for Milan is located there. It is quite a multi-cultural city, with workers from all over the world living there., including many who work in Milan. Varese is best known for being the site of a UNESCO World Heritage location (something that many Postcrossers are interested in, for my readers who are not Postcrossers.) One of the nine ‘Sacred Mounts’ is located here. The nine Sacred Mounts of Northern Italy are groups of chapels and other architectural edifices constructed in the 16th and 17th centuries, dedicated to different aspects of the Christian faith. In addition to their symbolic and spiritual significance, they also possess notable characteristics of beauty, virtue and pleasantness, and they are integrated in natural and scenic environments of hills, woods and lakes. They also contain very important artistic remains (frescoes an statues)”. With this motivation, in 2003 the UNESCO registered the site “Sacred Mounts of Piemonte and of Lombardia” in its World Heritage List. More information can be found here at the Sacri Monit website. 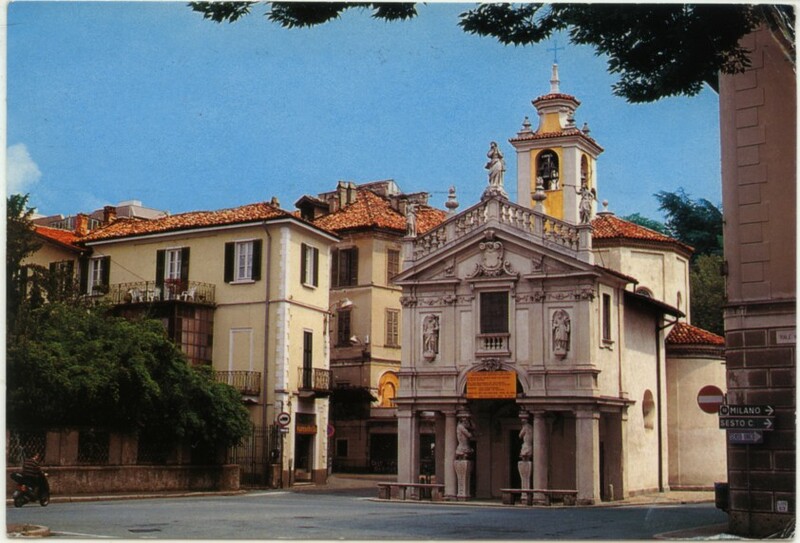 The building that is the focus of this postcard, however, is the Church of Madonnina in Prato. The name of the church means ‘ Madonna in the Meadow’ which is a reference to the Virgin Mary who is the mother of Jesus in the Christian faith. The church represents “one of the most authentic examples of devotional Baroque style architecture in Varese.” (Whatever that might mean! I even read a Wikipedia article about Baroque architecture, and I still don’t know.) But anyway, it looks kind of interesting. Below is a little video that I think shows some of the history of this church. If you speak Italian you will find it even more informative – I just got to look at the pictures. This is a very nice card with some cute birds on it, but there is no information on the back of the card. 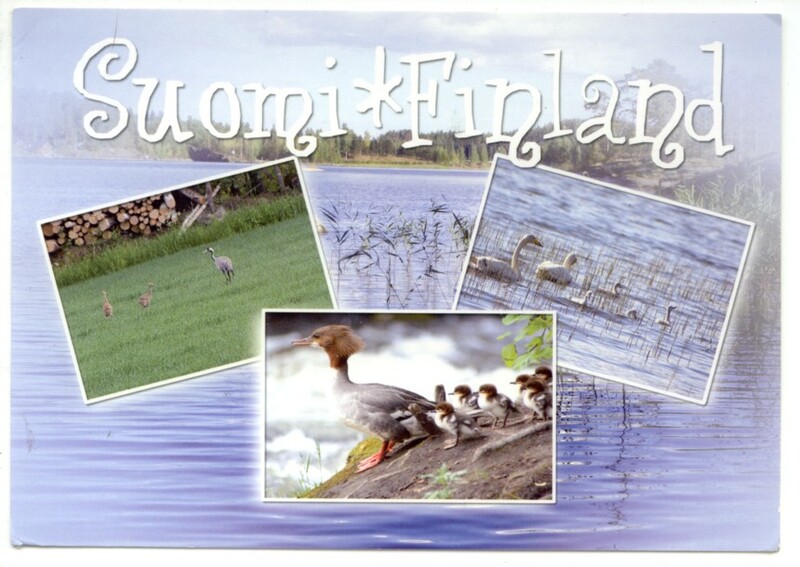 The only thing I can’t read is PAINETTU SUOMESSA TRYCKT, but I don’t think that tells me the names of the birds. If anyone has any ideas – especially about the little family in the middle picture, please leave me a comment! Two out of the five residents got lucky anyway. Two of us had a good mail day! I’ve only received two Postcrossing cards until today, which I was being to feel a bit hard done by about, as I’ve sent out eleven. 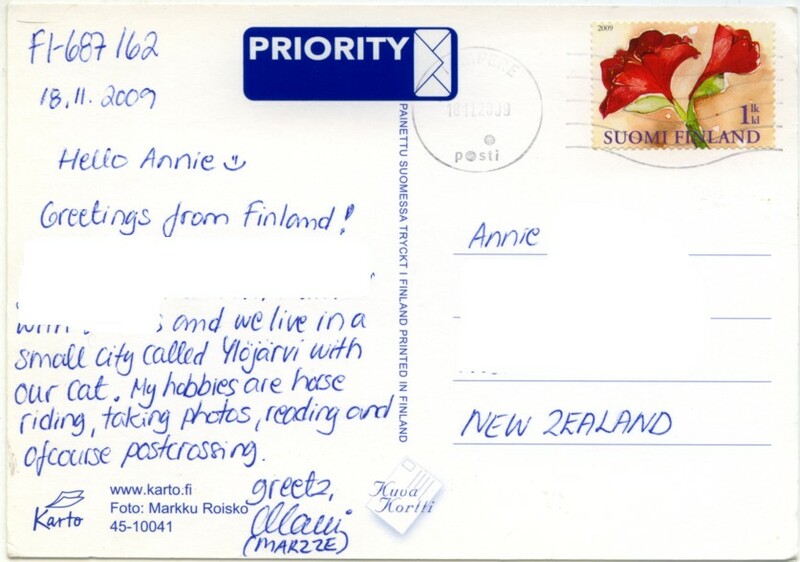 But today I got three, all at once, from Japan, Finland and Italy. (Plus emails for two received that I sent.) Total randomness that three postcards sent on different days from completely different parts of the world end up together in my postbox. I was amused. And happy. I’ll be off shortly to do a bit more research about the pictures on them. 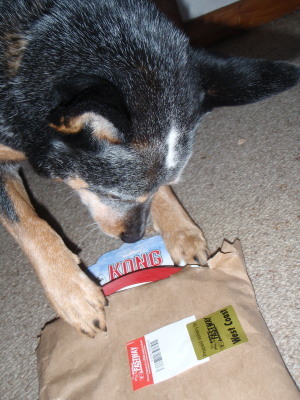 But before I go here are some photos of the other lucky mail recipient opening his courier parcel. 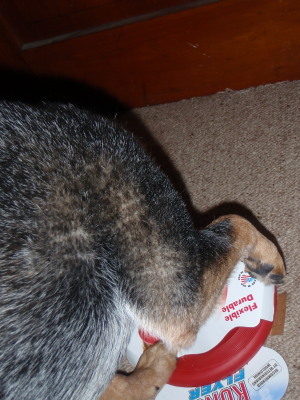 How do you get this cardboard thing off? Does he look like a Kyle…… ? Well, I got sucked in. I guess you have to expect that when you volunteer at a place like the SPCA. This is Kyle. 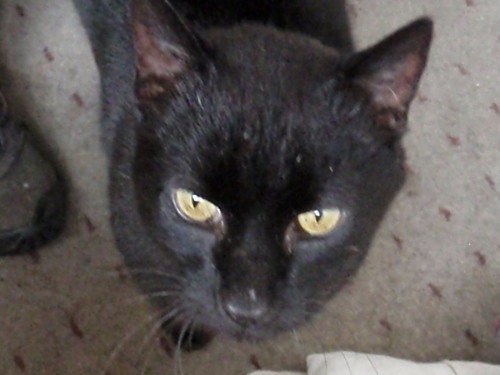 He’s home visiting with us at the moment to see how he gets on with the dogs. So far he does not sit still for 2 seconds when I go in to see him (he’s hanging out in the bathroom) so these are the best photos I can offer. He smooches alot and purrs like a jet engine, so he definately loves humans anyway. 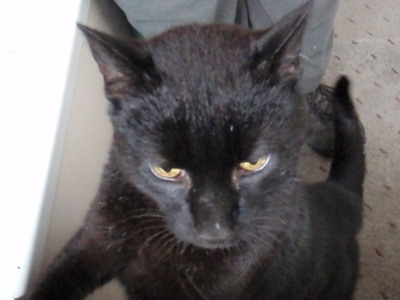 The manager says he must be someone’s pet, but no one has claimed him after 12 days, so he’s up for adopting. But the question is: Does he really look like a Kyle?? That was the name he got allocated when he got brought in, so we can change it if he stays. 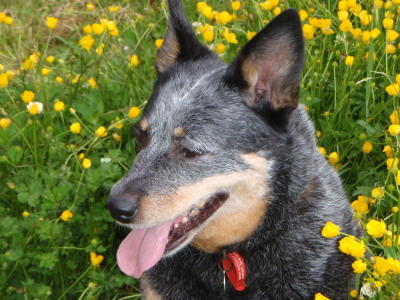 Anyway, if any of my doggy readers out there in cyberspace have hints or stories about introducing adult dogs and cats to each other, now is the time to tell me. No matter where you blog, or if you don’t, you should be able to comment. BTW – I’d forgotten how cat logic works. He has got a big pile of comfy blankets in the corner. He has chosen to snuggle down on the damp shower tray………. 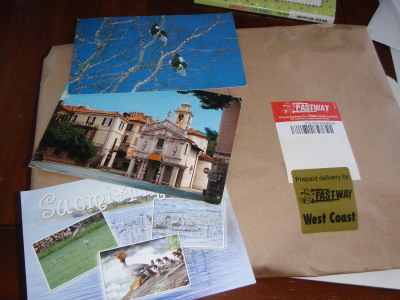 My second ever Postcrossing card received arrived today, just when the suspense was almost too much for me. I can see that this is a hobby that leads to the development of patience!!! 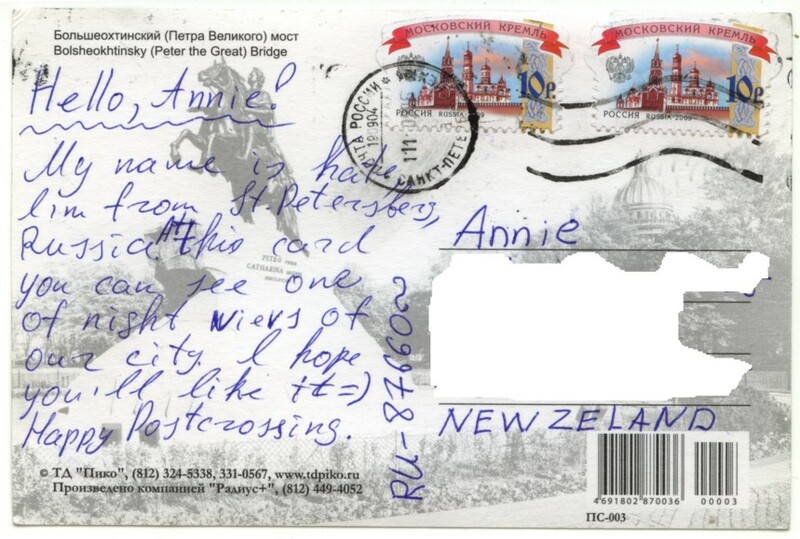 It is from Iavrile (Kate) in Russia. The picture is Peter the Great Bridge in Saint Petersburg. It crosses the Neva River, which has the third greatest volume of any European river after the Volga and the Danube. The bridge itself is a compression arch suspended deck bridge. This is the same type of bridge as the well known Sydney Harbour Bridge in Australia. A compression arch bridge can have the deck hanging, or suspended, from the arch as in these examples, or the deck can be above the arch, an example of which is the Glen Canyon Dam Bridge over the Colorado River in Arizona, USA. 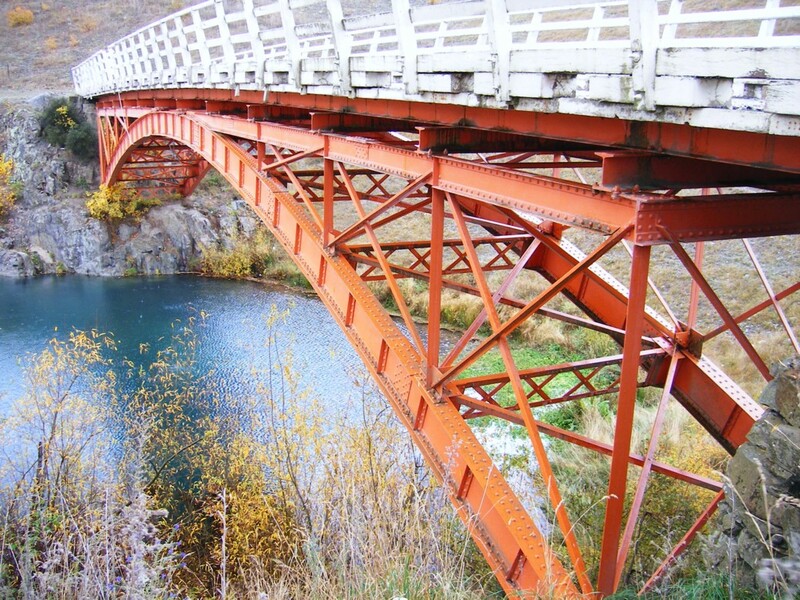 A bridge was first suggested in the area of the Peter the Great bridge in 1829, but the actual process of building a bridge only began on 1907, prompted by the tragic sinking of the passenger ship Arkhangelk . At that time, by ship was the method of crossing the Neva River. A contract for building the bridge was quickly settled on with a company from Warsaw, Poland, and signed later in 1907. Though the bridge was not open for traffic until 1911 it was formally opened on June 26th, 1909 – exactly 200 years after Peter the Great won a battle called the Battle of Poltava in a war between Russia and Sweden. The bridge carries 4 lanes of vehicle traffic and 2 tram lines. Originally it was named the Emperor Peter the Great Bridge, which was changed to Bolsheokhtinsky Bridge (or Okhtinsky for short!) 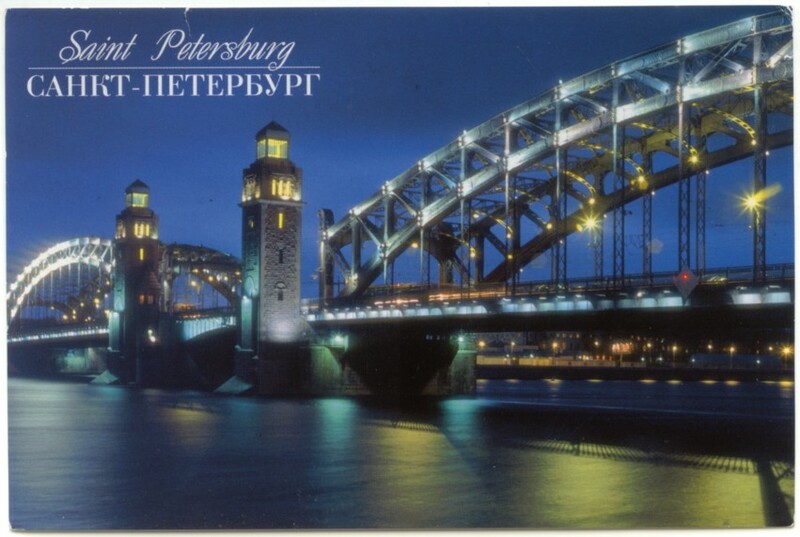 in 1956, and then renamed as Peter the Great Bridge in 2004. Today people use both names. So my exploration of the world today has been a history and bridge building lesson. 'Leafed Over' vs ' Iced Over' ? Does this photo seem somewhat familiar? It’s one of a series taken at the cache Iced Over, another of which has been used for the header photo for this blog. I was reminded by the autumn photos on the blog, Where the Fatdog Walks, that I intended to write a post about my header photo. As I change the photo from time to time I will also add a post about the photo. I have a fondness for autumn photos, perversely because the part of the country I live it does not really have distinctively visual changes of season. So I’m always on the look-out for lambs and blossoms in spring and golden leaves in autumn when we are travelling. On this trip in April 2008 I got a good dose of autumn colours. 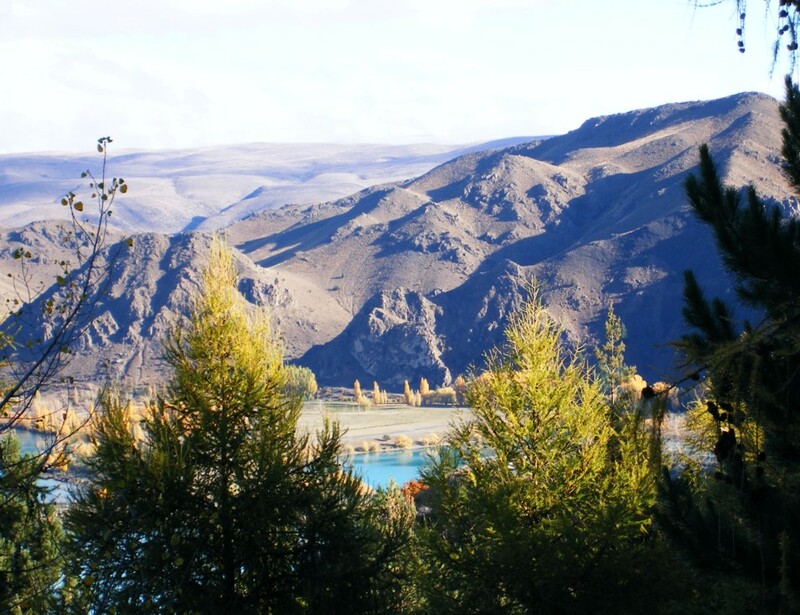 Our caching trip took us from Geraldine to Fairlie and past Lakes Tekapo & Pukaki and down the Waitaki Valley. 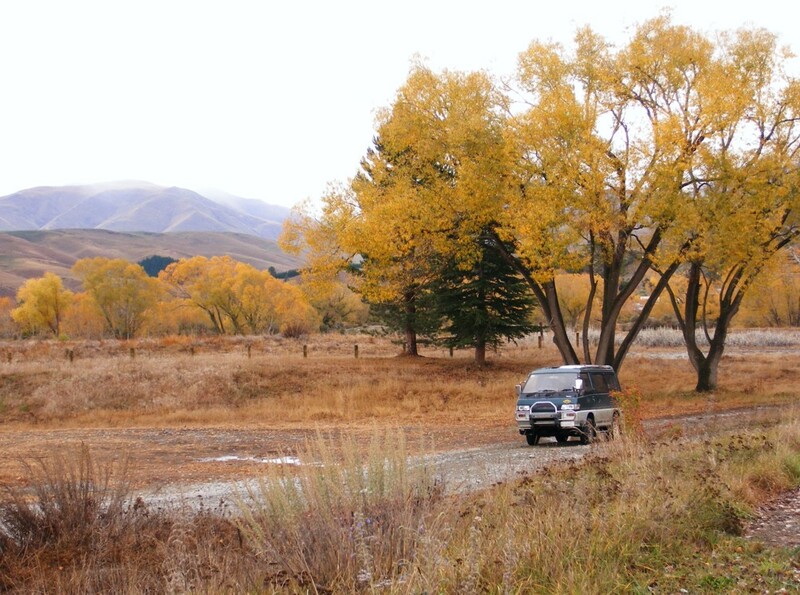 We found 31 caches on our journey between Geraldine and Oamaru, and enjoyed the stunning autumn show along the way. Some of the highlights in the many postcard perfect settings are illustrated by the photos below. 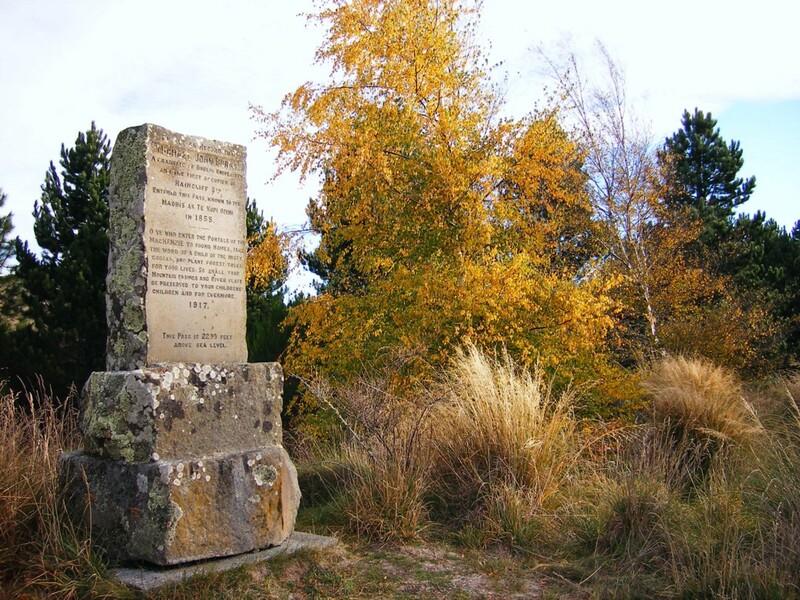 This short multi – A Dog’s Tale GC17F6X – is in the little settlement of Fairlie at the start of the “Mackenzie Country”. 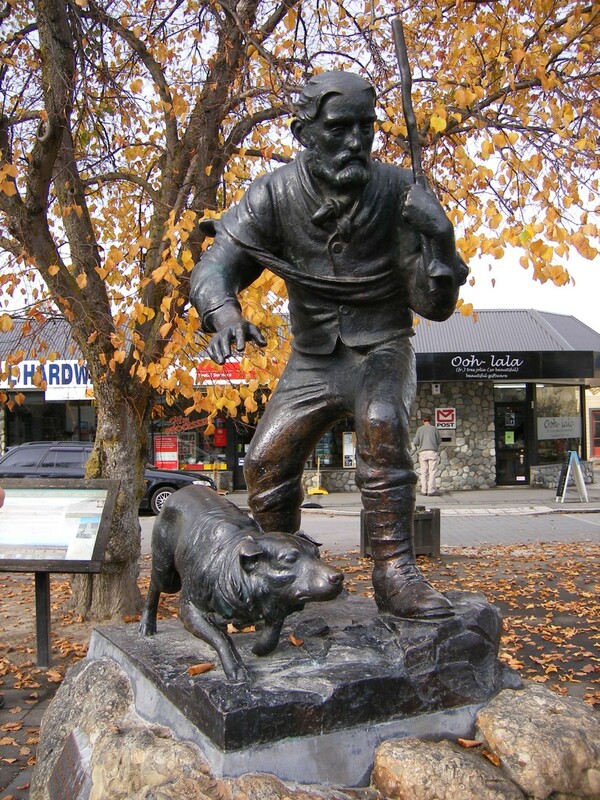 This statue of Mackenzie and his dog Friday is the first WP. James Mackenzie was rouge and outlaw who made his name in sheep theft. His exploits are part of the early history of this area, and his ‘fame’ is such that the area now bears his name. He is reputedly of Scottish origin and an interesting read can be had here telling more of his story. 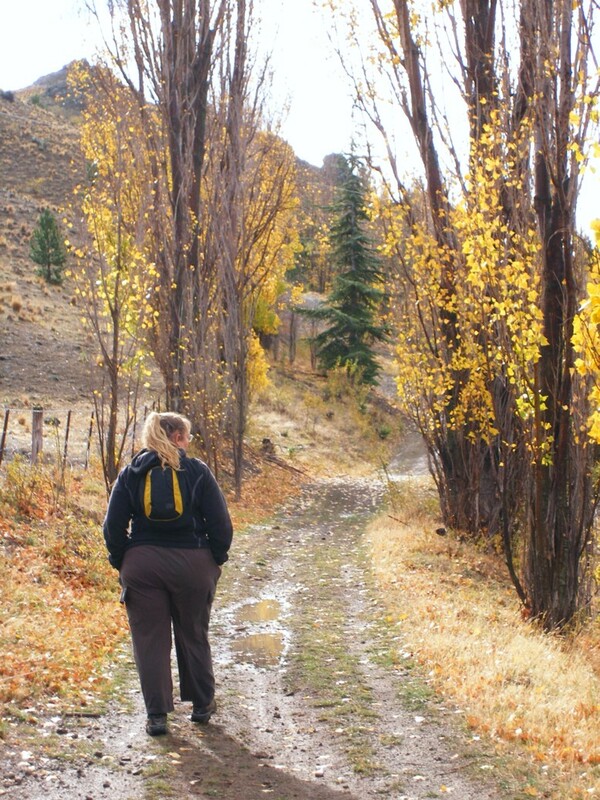 We must have collected our numbers correctly for the cache as we found the final to be not too far away – close enough that whichever direction you are travelling this cache is quite accessible without great delay to your travels. The next cache I would like to highlight is Te Kopi Opihi GCTF57. Te Kopi Opihi is the Maori name for this pass, known as Burke’s Pass to the Pakeha. Burke’s Pass has its own little website with some brief info. and plant forest trees for your lives! be preserved to your children’s children and for evermore. Words we could do to heed still today about planting trees rather than chopping them down!!! Just a little further on, if you are journeying south, is a cache called Dog Kennel Mackenzie GCA42C, which is near a small cairn marking the location of an historic ‘boundary dog’ kennel. This would have been the home of a dog that was chained here semi-permanently to prevent the property owner’s sheep wandering in the days when there was not a fence. 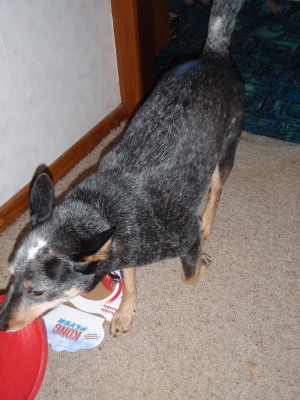 This link shows a picture of the site: Dog Kennel Corner. Personally I wonder how often the poor creatures got fed, and whether these canine guardians actually spent their time daydreaming of when a sheep would get close enough to provide a small dinner-time snack. The cache itself here was not an easy find, and not a very pleasant area for searching due to its unfortunate use as a ‘convenience stop.’ However the location is another intriguing little bit of New Zealand history, and worth a few moments pause in your journey, even if you decide not to look for the cache. This next picture is pretty much a New Zealand tourist cliché, if ever there was! 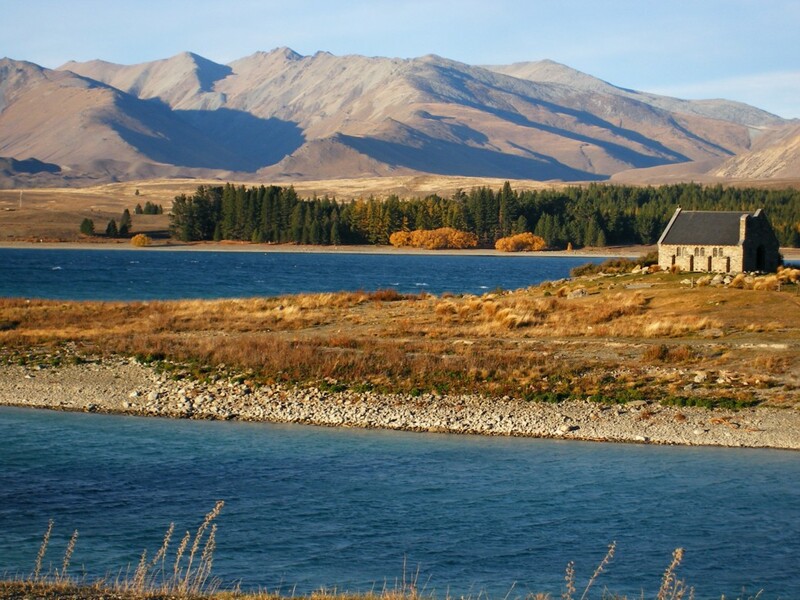 This is the Church of the Good Shepherd at Lake Tekapo. This link to the NZ Historic Places Trust gives the official information about the building. The reason we were taking our picture was to complete the Earthcache Tekapo, the Turquoise Treasure GC18045, which we did on a rather chilly autumn day. I think if we had been here earlier it would have been lovely, but as it was, we got here later in the day and the shadows of the mountains were beginning to fall over us as we were collected our information and taking the required photos. If one were to search of Flickr or any other photo site, I’m sure a thousand similar photos to this one – and the church from every other angle possible – have been taken by passing tourists!! It is truly a stunning location however, and the view out the altar window inside is awesome in almost any weather. So if you’re travelling/caching this way it must be on the list of places to spend a little time at. And this is in fact the case as New Zealand’s large back country sheep stations still complete their muster in the traditional way, on horseback with their sheep dogs at their heels – even though there may be aerial support in the way of a helicopter of light plane to direct the shepherds to the mobs of sheep to speed the process somewhat! 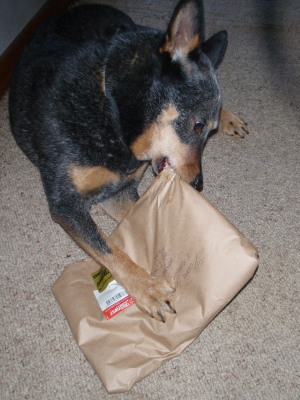 And that brings me back to our original photo and cache – Iced OverGCPC00, now archived. The cache itself here is(or at least, was) a relatively quick find just off a parking layby. The little pond, on the other hand, was one of those tiny perfect spots that most folk just blindly drive past, but we are fortunate to be shown by the hunt for a small plastic box. 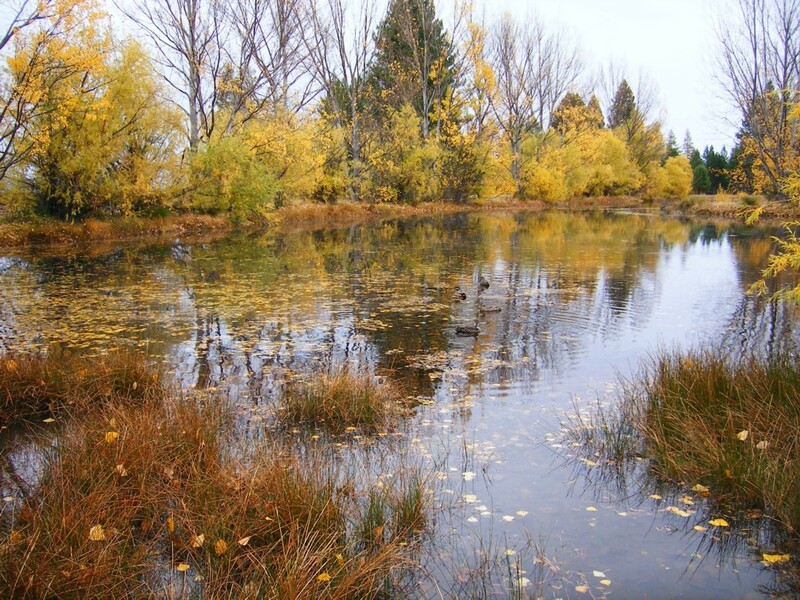 The leaves were literally floating just below the water’s surface, the ducks were paddling amongst them, and an image of peace and serenity was created the stayed in the mind for a good while. I believe in the depths of winter the pond does ice over enough to skate on, and if you look at the cache log for July 10th 2009, you will see a new meaning to ‘iced over’. Will provoke a sympathetic laugh amongst many cachers! 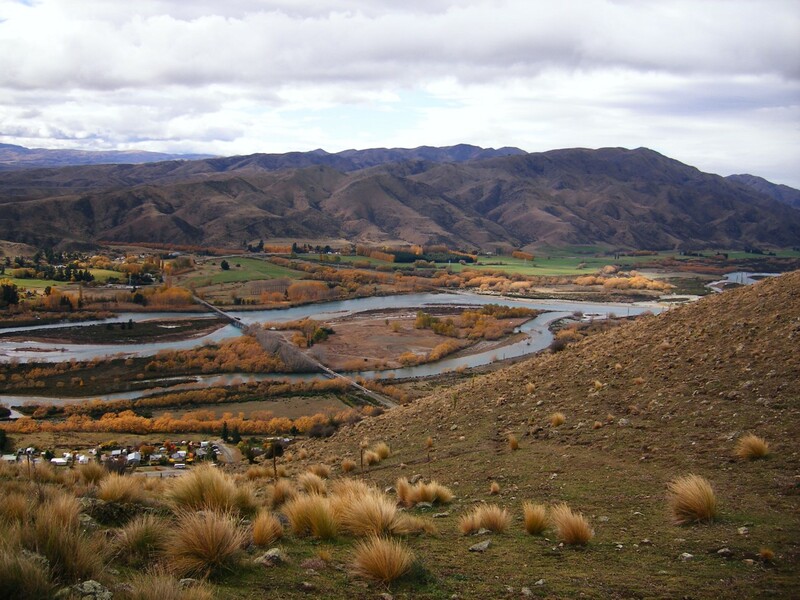 There are a number of other caches in these areas as well, I’ve only mentioned a few that particularly stand out for me after 18 months of so, and I plan to continue with the rest of our journey down the Waitaki Valley in tomorrow’s post. 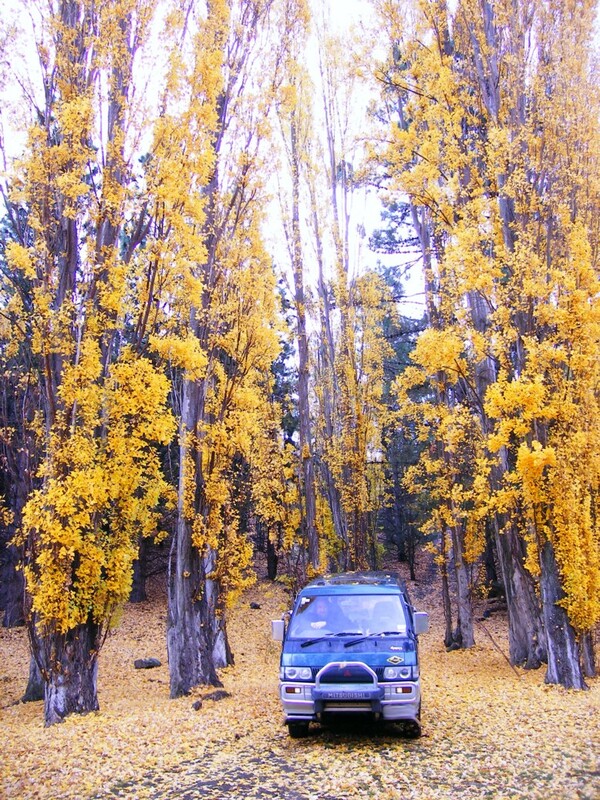 What’s your favourite season, and do you have photos online that show it? Coments most welcome – everyone should find it much easier to comment on this blog now that I have changed a few settings!